Neck pain is one of the most common problems that two-thirds of the population has ever visited doctors because of it. The discomfort may occur in any of the structures in the neck including bones, muscles, nerves and the disks between the bones. A number of diseases may also cause severe neck pain. What Are the Symptoms Accompanied With Neck Pain? When there's an issue with any of the structures in your neck, you may experience pain and some other symptoms as well. These symptoms include tingling, numbness, sharp shooting pain, tenderness, swishing sounds in the head, difficulty swallowing, dizziness and lymph node swelling. Sometimes, neck pain may also be accompanied with facial pain, headache, arm numbness and shoulder pain. You usually witness these associated symptoms when you have a pinched nerve in your neck. When left untreated, the pain may even radiate to the upper or lower back. The cervical spine (neck) is a well-engineered structure that houses your spinal cord and allows for easy head movement in all directions. Within the neck, there are structures such as the skin, arteries, neck muscles, lymph nodes, veins, parathyroid glands, thyroid gland, larynx, esophagus and trachea. Different diseases or health conditions can affect any of these tissues in your neck and cause mild or severe cervical pain. Here are common conditions that may cause neck pain. Muscle strain. Due to overuse, your neck may feel sore to such an extent that it becomes difficult to turn your head side to side. The condition is known as "stiff neck". Sometimes, minor things like gritting your teeth or reading in bed can strain your neck muscles. Worn joints. 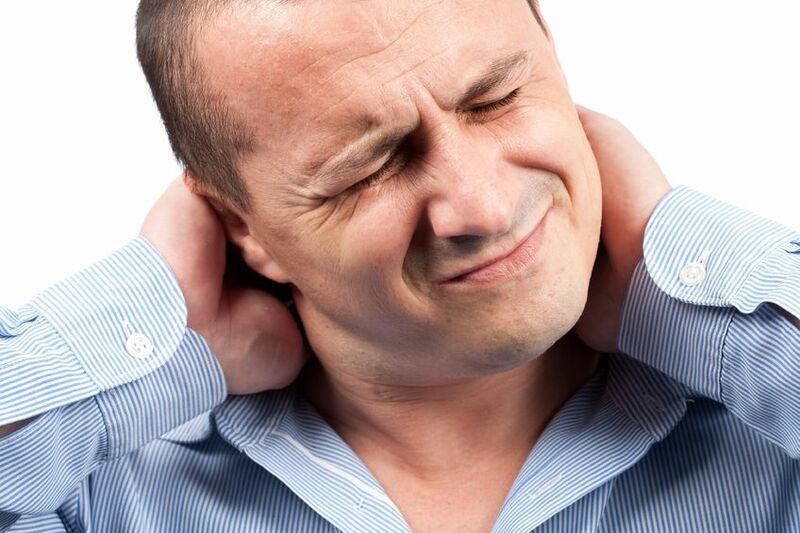 You may have an aching neck due to the wear and tear to your neck joints. Like other joints in the body, your neck joints will wear out with age, which may lead to osteoarthritis in your neck. Nerve compression. Bone spurs and herniated disks can compress a nerve branching out from your spinal cord. You may feel pain with a tingling and burning sensation. Injuries. Whiplash injuries caused by rear-end auto collisions may overstretch the soft tissues of your neck and lead to severe pain. Disease. There is a thin tissue surrounding your brain and spinal cord, and a disease like meningitis may damage the tissue and cause inflammation with intense pain. You should seek immediate medical attention if you have symptoms of meningitis. In addition, your neck stiffness and pain may be due to infections, congenital abnormalities, tumors, abscesses or cancer of the spine. You usually need to see your doctor to identify what's causing the neck pain in your case, but most types of neck issues respond well to home remedies. Even if you're taking prescription medicines, sticking with the following home remedies may speed up your recovery. Using a heating pad on low setting for 15 minutes may help relieve pain. Repeat this step after every couple of hours. You may also want to take a warm shower or try single-use heat wraps for convenience. Sometimes, the neck pain responds well to ice packs, so try it for 10 minutes every couple of hours. It is important to keep your neck moving, as it helps keep the muscles stay strong. You just need to practice some care though and avoid activities such as sports or anything that could make stiffness worse. Doing stretching exercises will help a lot. You may consider taking a massage to encourage blood flow in the neck, but avoid it if it hurts. You can try certain over-the-counter pain relievers such as Acetaminophen or non-steroidal anti-inflammatory drugs like naproxen and ibuprofen. These drugs will reduce inflammation and alleviate pain. Maintaining a healthy lifestyle will reduce the risk and even help you recover from pain. Try meditation and use relaxation exercises. Say no to tobacco because it affects your immune system and hinders the natural healing process. Select some aerobic exercises like walking for better circulation and stronger muscles. Above all, you should maintain proper posture when working in the office. Get your back supported to keep it straight. Adjust the height of your chair to ensure your computer monitor is up to your eye level. And remember to take short breaks and stretch your neck. How Is Neck Pain Treated Medically? If the symptoms persist after a week of taking self-care measures, it's time to see your doctor and figure a treatment plan. You should look for medical assistance if your neck hurts after an accident. Your doctor will consider your situation and suggest a treatment accordingly. Your doctor may prescribe stronger medicines when OTCs don't seem to offer any pain relief. These may include some tricyclic antidepressant medications or muscle relaxants. Your doctor may suggest working with a physical therapist who would share some basic neck exercises and stretches. They may even ask you to consider traction, a therapy that usually produces quick results and offers better pain relief to neck pain. Traction is a suitable choice if your pain is related to nerve root irritation. Short-term immobilization that involves wearing a soft collar to support your neck may also work in some cases. Just avoid wearing a collar for more than two weeks. Taking steroid injections may become an option when regular pain relievers don't work. Your doctor will inject corticosteroid medications near the nerve roots, which then get into the muscles of your neck to alleviate pain. Sometimes, a healthcare professional may choose to use other numbing medications like lidocaine to relieve pain. Neck pain usually goes away with medications and moderate lifestyle changes. Steroid injections may help as well. When nothing seems to work, or the cause of your pain is spinal cord or nerve root compression, your doctor may recommend a surgical procedure. Be sure to discuss implications before opting for surgery.